Sterling Gates On The Adventures of Supergirl: "I'm Thrilled We're Getting Physical Copies"
Tomorrow night marks the season finale of Supergirl -- but fans of the CBS version of the Girl of Steel won't be without her for long. Coming to comic shops in May is The Adventures of Supergirl, a new, twice-monthly series from writer Sterling Gates and a revolving cast of all-star artists that will tell Supergirl stories set in the world of the TV series. The comic started as a digital-only anthology, but fan and retailer demand for a Supergirl monthly has encouraged DC to bring it to print. You can check out the first few issues digitally on ComiXology. The first print issue of The Adventures of Supergirl will hit the stands on May 11. ComicBook.com had an opportunity to talk to writer Sterling Gates ahead of the release, to talk about the series. Obviously, people got excited when your name was announced because of your history with Supergirl. But does your history being in-universe DC Comics make it a little jarring to write a book set in a different world with the character? It's not jarring at all. If you know anything about my work or have followed me on Twitter over the years, you'll know that Supergirl is one of my favorite comic book characters -- if not one of my favorite fictional characters -- of all time. I'm a firm believer that she is always at her best an optimistic and hopeful voice in a dark and cynical world. I think that the show speaks to that and their version fo Supergirl portrays that, so for me, I'd watched however many number of episodes before I started writing, so I had a pretty good handle on how the show was going to approach Kara and it was just filtering that sort of mission statement I have for Supergirl through their lens, which was not that big a switch from what Jamal Igle and I did from 2008 to 2011. The show has borrowed pretty liberally from your run. Has it been interesting to you to see how they take your stories and tell them through their lens? It's been exciting! When they announced that Reactron was going to be one of the villains of the first few episodes, I flipped out. We worked really hard ot make Reactron a huge villain during New Krypton and hear that our work stuck in some way was really gratifying and really exciting and at the same time kind of humbling. When you work on these books you never really know the impact your work will have. And Reactron, no offense to Paul Kupperberg, was sort of a lesser-known villain in the Superman universe and during New Krypton we worked really really hard to build him up and make him scary, and make him a threat, and name a Supergirl rogue. Supergirl traditionally hasn't had many of her own villains. I mean, I can name Superman villains, I can name Flash villains, I can name Batman villains, but when it comes to Supergirl -- and I love the character and have followed her for years -- I have hard time putting together a top ten list of villains. So we worked really hard to find five or six villains to build up -- and to learn at San Diego last year that Reactron had stuck so well that the show was going to use it was very exciting. I called Jamal and said "you'll never believe what they just announced!" So it's awesome. I'm thankful that they seem to have read our work and some of that's filtered into teh show. Obviously Greg Berlanti and Ali Adler and Andrew Kresiberg have their own take -- they have their own agenda and stories that they want to tell -- but it's been really cool to see villains that we worked hard to build up make it on the show. So when are we going to get Jamal to come in and do a guest issue?! Jamal has his own projects that he's actively pursuing and he's been very successful with them, so talk to him. I'd love to work with him again. The art teams in the first few issues have a very similar kind of feel throughout, even if they doni't look all that similar side by side. How important is it to you that the book has a consistent tone, even though the art teams rotate? It was important to us to have the best artists possible, and it's important to me to work with artists who were really excited about the material. Everyone on the art team loved this stuff and is so excited to get to delve into this world in a lot of ways that the show necessarily can't, and do big comic book, massive stories with this version of Supergirl. So it was important to me in talking to all of these artists to get a feel for what they were excited about and get a feel for what about the show spoke to them, and try to tailor the stories to them. Bengal loves the light-hearted adventures and that that Rampage story gets into some dark territoriy here and there, but it's generally a very light action story. Cat Staggs did a very serious chapter, as Supergirl confronts Alura, and she asked me to write something to that. She loves that relationship on the show. For me, it's important that each artist has a story that speaks to them and speaks to what they like about the show and from there it's just finding stories that fit the overarcing story that we have planned. I've really loved the winks and nods to previous creators -- like Rampage being a Byrnian, since there aren't metahumans on Supergirl and you need to be an alien. In a case like that, do you spend a lot of time turning it over in your head trying to make your depiction true to the character, even when you have to make big changes? That comes out of conversations, and that comes out of what the goals are for each character. What does each villain represent for Supergirl? What hurdle does each villain put in front of Supergirl that she has to overcome successfully -- or fail, depending on who she's up against? In terms of doing little Easter egg shout-outs to the creators that have come before, if you're familiar with my work you know I do that sort of often. I'm a firm believer that when you work on these characters, you are building upon a world that thousands of men and women have worked to build before you -- and if you can give a shout-out to them in a very subtle way that doesn't detract from the story at hand, I think you've got to take that. When we were talking about Rampage, and she was always going to be an alien, I thought it would be so funny to have her be from a John Byrne planet, becuase John Byrne created Rampage and I'm thankful that he did. You also mentioned David & Frank's, an allusion to my all-time favorite Supergirl run as a teenager. Yeah. Those little Easter eggs are there for long-term fans. And I'm a long-term fan; I've been reading Supergirl for most of my life. If you're a new fan and you're coming into the comic because you like the show, you have no idea that Peter David and Gary Frank did an award-winning run on Supergirl in the late '90s and it does not detract from anything. I love those little Easter egg things, and I love when I have a chance to give homage to other creators. I think that's important when you can. And hilariously, David and Frank's is also a take on Musso and Frank's, which is a famous Los Angeles restaurant, because National City is mostly Los Angeles. I thought it was a fun, clever way to make reference to a famous restaurant that exists in our city of Los Angeles. How much do you talk with -- I would assume it's Geoff or somebody, but, whoever you decide is on and off-limits for the book? I had some meetings with the show producers and with DC and I pitched them the villains that I wanted to use. They didn't approve all of them, but the ones they approved are the ones that are in The Adventures of Supergirl. We're also introducing a new villain -- and I can't tell you much about that because that story is still cooking along -- but we're introducing a new villain and I pitched that in that document as well. With the TV show, you had originally not been billed as a book that was necessarily going to go to print. Then it looks like if there's a Season Two, you'll be basically printing during the off-season. Is that almost an ideal way to go about this? I'm thrilled we're getting physical copies. That decision came out of fan support and retailer demand. It deviated our plans slightly, but for the most part, we knew we were always going to have a physical trade paperback. Now, having physical issues in stores, it's exciting. I love having physical copies of books. I've been a comic collector for twenty-nine years now, so I love having physical books and when the word came down that retailers were asking for this material, I was really excited to hear DC announce that it was going to be a physical book. I think it's really important to fans to have this book coming out, because it helps get them excited, as you've said, and it keeps this version of Supergirl in their heads across the summer. For me, it's important that fans and retailers have this in their shops. I love the digital format, so this is the best of both worlds because now we're hitting both types of fans. It's sort of the best outcome possible that we could have hoped for because anyone who wants to find this material can find it, and it's an age-appropriate, science-fiction superhero story with some really dynamic art that you can hand almost anyone, and they don't even need to know who Supergirl is because the first issue explains it in those first few pages. That was a very intentional decision on our part because I always get nervous when doing stories like this that there will be someone who doesn't know who these people are. With this book, you've got a lot of potential new comics readers because of the TV show. As a writer, does that present you an opportunity to open up the larger DC Universe to people? The hope is always to lead people back into the larger DCU, but at the same time, you want to tell a fun, engaging story with the characters as they're appearing on TV every Monday night. My goal is to show how awesome Supergirl is and to give readers a chance to see how excited we as creators are about Kara, and energize the fan base and engage them and get them excited to go to the shop every two weeks to go to the shop and get the book. We want these characters to live forever. The only way to ensure that happens is to tell great stories with them, that get people excited about these characters. 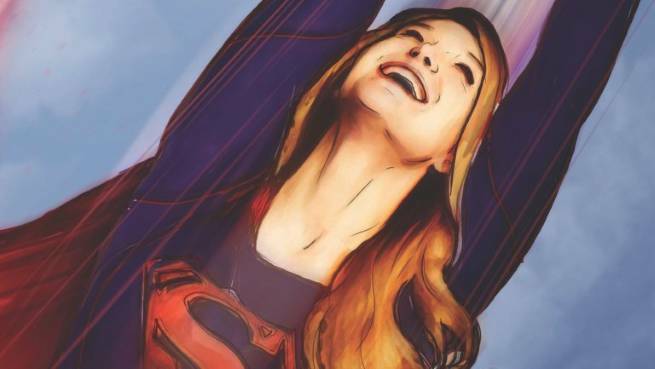 These characters only exist as long as fans want them to, so if fans are as excited about Kara Danvers and love her like we love here, then there will always be Supergirl stories.